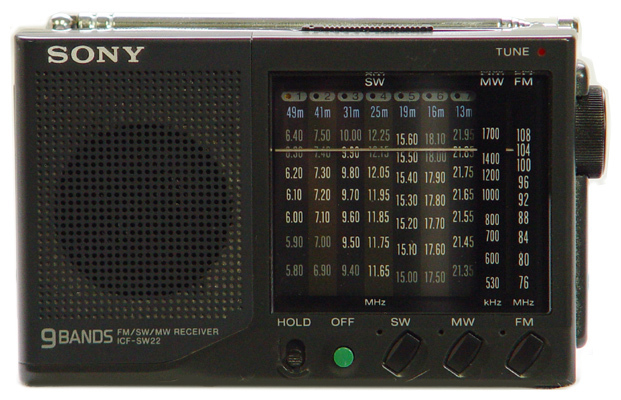 The Sony ICF-SW22 portable receiver covers AM, FM 76-108 MHz and seven shortwave bands. This portable has an analog dial. Shortwave coverage is: 5775-6425, 6875-7525, 9375-10025, 11615-12265, 15000-15650, 17500-18150, 21325-21975 kHz. 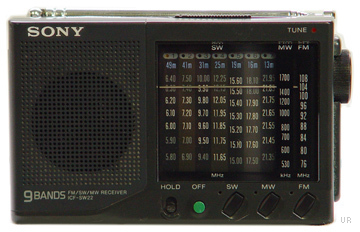 The radio features a 1.675 inch speaker, hold button, and two-way tone switch. There is a jacks for earphones. 4.5 x 2.875 x 1.125 inches 7 oz. Requires two AA cells (not supplied).